A few days ago I mentioned “full-service” airlines Swiss and KLM, but recently I flew Cathay. People rave about it, but I have to say I found it average. The seats were comfortable but really cramped, and the difference between the upright and relaxed position were difficult to spot without a microscope. I guess their core market is Asia, where people are on average a little shorter than I am. But what stood out for me on that flight was that I was running late, as my train was delayed. So with 30 minutes to take-off, I was still making my way to the gate. How surprised was I to get a call from Cathay, wondering if I still planned to fly with them today, as they hadn’t seen me at the gate yet. A personal touch for a non-frequent flyer that, just like EasyJet’s gesture, doesn’t really cost them anything and probably helps them plan their gate procedures. Maybe not nice enough for me to look forward to folding up in their seats again, but who knows. When you fly with “cheap” airline EasyJet and you arrive early for your flight home, they will put you on an earlier flight for free if there is space. A nice gesture that costs them nothing (in fact it’s positive for them as it gives them a – be it slim – chance to sell the seat you just opened up on the late flight, whereas surely nobody was going to buy a ticket anymore on the flight that is just about to leave). But the point is, it costs them nothing, it’s a nice gesture, the customer is happy. Try to do that at “full-service” airlines Swiss or KLM. If the person at the check-in is nice, you may be fine. If he/she follows the official rules, they’ll send you to the ticket office to BUY the change. The ticket office will then display the flexibility of a concrete wall, lecture about how your class of Economy doesn’t allow this, etc, etc (don’t get me started on how there can be a dozen classes of Economy that are neither logical nor clearly explained nor have any resulting effect on what the customer gets, except for how difficult you make life for him/her and how much you charge). Anyway, the point is, if you have a business and there is something you can do that doesn’t cost you anything and makes the customer happy, do it. Yes, give some thought to whether the customer can game the system, but the vast majority of them won’t and will simply appreciate your gesture. What could a bike company do to make your life more enjoyable? Let me know in the comments section of this post or on twitter. Which explains exactly why even if such a “can’t fail” plan exists, it would be foolish to follow it. Plans that can’t fail are per definition plans that many people will follow, which means that there is no money to be made with it (supply-demand, that stuff). Which of course in turn means the plan fails, and so it wasn’t a “can’t fail” plan to begin with, merely an easily executable project without reward. Being “backstage” at the Formula 1 Grand Prix for four days last week, the one person who stood out for me was Sebastian Vettel. I don’t think I’ve ever seen an athlete so relaxed. He made time for everybody to have a little chat, take a photo, sign an autograph, on and on. Most drivers didn’t seem to be going anywhere without their agent by their side and a bit of nervousness in the air. They too would allow for a few photos and autographs, but then they’d duck into their secluded areas as quickly as possible. Even at the eve of the race, when most drivers left around 5pm, Vettel walked out at the same time as I did, sometime after 7. Yes, I know, he didn’t win the next day, but being able to stay that calm in a sport that is mental as much as physical has to be an advantage. It made me think if I know of a rider who is as calm before a race, but I can’t think of any. It’s not that they are all nervous wrecks, far from it, but Vettel was at a different level of serenity. The only time a cyclist claims to be that calm or “tranquilo” is if they have just been accused of doping. Have you ever noticed that, how the first response is often that they are tranquilo? How can that be, if you’ve just been accused of the worst thing possible in your sport? Was it no surprise? Would you not go out of your mind if you’d just been notified of a false positive? I spent this weekend at the Montreal Formula 1 Grand Prix. After trying to get cars out of cycling, I wanted to see if we could do the same here! But seriously, it was good to be back in Montreal, where Phil and I started Cervelo after we met in the composite materials lab of McGill University. 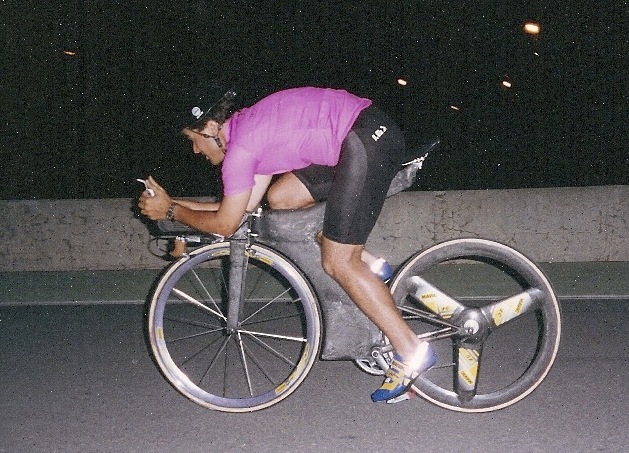 What most don’t know is that the first meters ever ridden on a Cervelo were at the Montreal Formula 1 track. It was early June 1995. We were just finishing up the last bits of the manufacturing (attaching a brake bridge to the hinged fork) and decided that the F1 track would be the perfect place to test the bike without any onlookers. As the curing of the last carbon layer took a bit longer than expected, it was 11pm by the time we got there. Someone from the Montreal Cycling team was our test rider, our friend Thomas came for support, and of course Phil and myself, all on this pitch-dark track. Really one of my fondest memories of the whole Cervelo time, to see our “first-born” – the Baracchi – float over the tarmac lit by a faint moon light. What I remember most from the bike was the steering, we had some pylons for a slalom and put them so tight that your brain just knew you couldn’t make the turn. But every time you would make it, thanks to the supershort geometry. Plenty of disadvantages to that, but cornering was brilliant. A moderate version of those ideas made it onto our regular bikes – without the drawbacks – and is one of the reasons our bikes handle so well. The other memory is getting back to the metro station. With the bike on the backseat, there was only room for two in the car. We took turns standing on the rear bumper, holding on to a rather unstable rear spoiler as we zipped along the track. The Cervelo story could have ended right there, but somehow we all survived.